The Perth branch of Accuweigh recently supplied Harvest Fresh Cuts in Bibra Lake, WA with five sets of A&D bench scales to weigh their small packs of fresh salads before distribution to retail outlets. This is an ideal application for A&D’s SJ bench scales and the unit is being used in various locations in the food processing plant as it is light and compact, for optimal portability. The bench scales are also equipped with a large stainless steel weighing pan for easy cleaning. These bench scales are powered either by plugpack or internal D size batteries that allow up to 800 hours of operation. An 'Auto Power Off' function also eliminates battery drain when the bench scales are left idle for more than a few minutes. 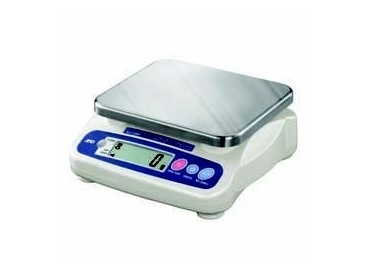 These bench scales have a large LCD display for clear viewing under all lighting conditions and are available in various weighing capacities from 1,000g up to 12,000g.